When I was in elementary school my teachers often doled out story-telling exercises. My classmates and I would each be handed an object (or an image of people doing one thing or another) and we were charged with writing a story based upon it. In hindsight I realize the purpose of these assignments was (among other things) to gauge whether or not there were any crazies in the classroom. To the best of my knowledge none were detected (and trust me, there were a few loose nuts to be found). So much for public education. I mention the previous anecdote because today I found something on Greenpoint Avenue that is a story crying out to be told. 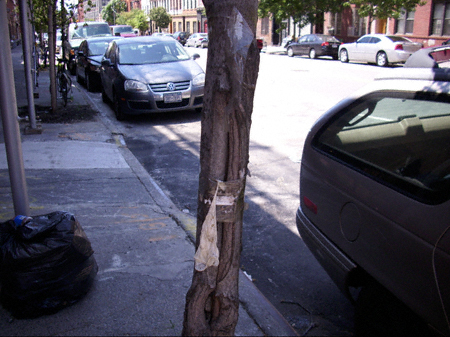 A female condom adhered to one of Michael Bloomberg’s 1,000,000 trees. In front of our local poultry slaughterhouse, no less. UPDATE, 6:45 p.m.: Apparently this prophylactic has resided on this tree since July 5th. I thought you’d like to see the deterioration process of the condom. Here’s how it looked on July 5, 2009 when it was reported to the Parks Dept. For obvious reasons, that’s one tree problem that I’m unwilling to tackle. P.S. : I threw up a little when I saw this.